BOLT THROWER - IN BATTLE THERE IS NO LAW VINYL (LP) | Online Shop | Wizard LTD. 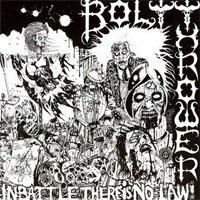 Album: "IN BATTLE THERE IS NO LAW VINYL (LP)"
In Battle There Is No Law is the debut album of Bolt Thrower. It is recorded at Loco studios by Andrew Fryer, and mixed at Clockwork by Alan Scott. It was released on Vinyl Solution as Sol 11 in 1988 and re-released on Vinyl Solution as Sol 11 in 1992, with a different album sleeve. The album was again re-released in 2005 with the old album sleeve restored.